Are you ready to work your wealth? Workable Wealth offers complimentary 30-minute consultations for those interested in working with a financial planner on an ongoing basis to help strategize and make better financial decisions. HAVE A LIST OF QUESTIONS AROUND YOUR FINANCES OR THINKING ABOUT YOUR GOALS FOR THE FUTURE? Let’s take some time to talk about the money obstacles you may be facing. Workable Wealth is here to help you gain peace of mind and clarity around how to use your money to live a life you love. We’ll meet via phone or video. We’ll identify issues that you may be facing, concerns you have and questions you’re looking for guidance on. No matter how the call goes, we’ll wrap up by leaving you with an immediate action step to implement in maximizing your situation right away. LOOKING FOR MORE FINANCIAL RESOURCES? 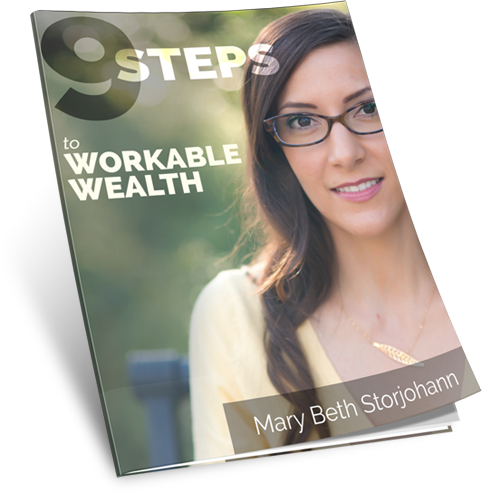 Be sure to grab a copy of the 9 Steps to Workable Wealth Guidebook.